If you're looking for the easiest, funnest, cheapest, and most colorful kids summer art project... you're at the right place. We've been dying up a storm over here and turning plain old paper towels into lovely dip dye art! Remember that Skittles commercial where we were encouraged to "taste the rainbow?" Weeeeeellll... I took it one step further. Today I'm sharing yet another rainbow-themed craft. 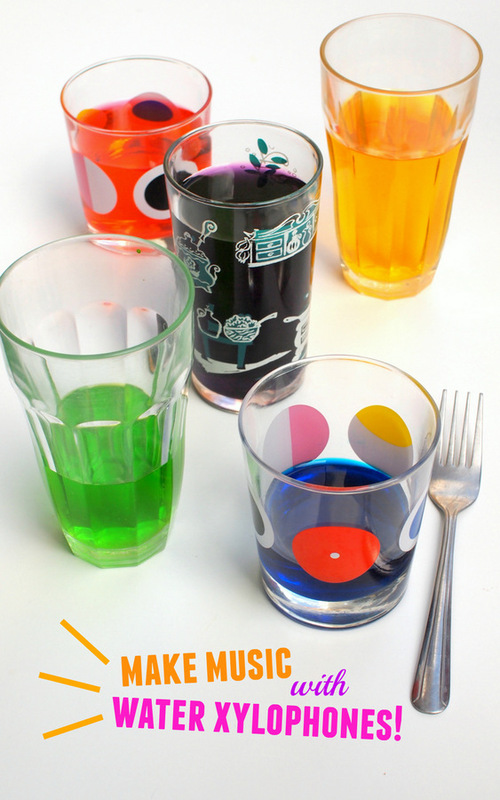 If you're NOT a fan of food coloring, avert your eyes! But if you're ok with using it once in awhile for creativity's sake, then read on, fellow color lovers! Here are two ways to make... (wait for it...) rainbow grilled cheese sandwiches!!! This post contains affiliate links. This means I make a teeny bit off of any purchases made through the links at no extra cost to you. Thank you for your support! For my full disclosure policy, click here. Make a Water Xylophone and start exploring Sound with kids! Awhile back I made this lovely apple faux stained glass using black glue as the "lead" and tinted clear glue (affiliate link) to paint colorful panels. Ever since making that craft, I kept wondering if there was a way to adapt it for preschoolers. 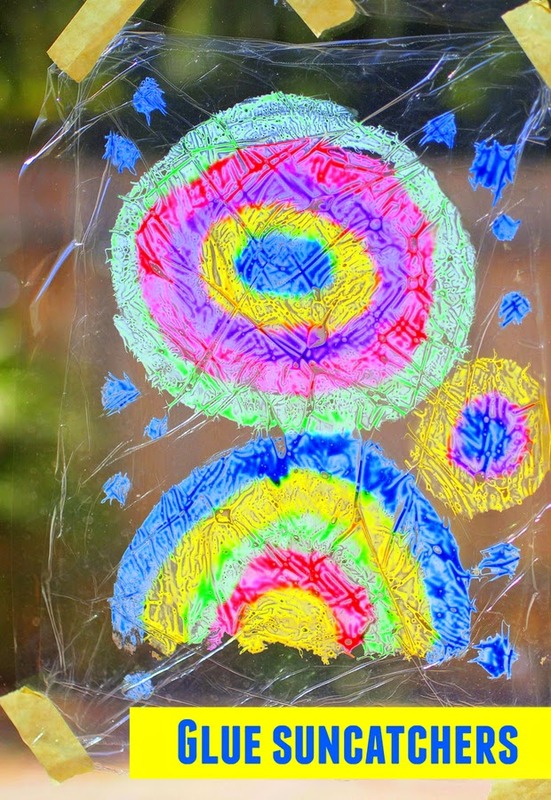 So I came up with this super easy kids glue sun catcher activity. It takes only 2 ingredients to make the "paint" and you probably already have all the materials on hand! 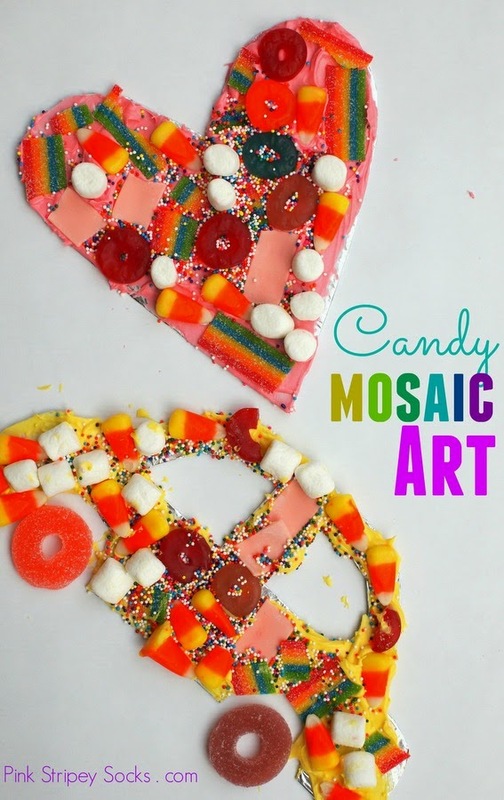 Are you looking for fun process oriented art activities for kids? As a craft lover, I'm definitely biased. I tend to pin images of kids crafts. I can't help it. There are always cute smiles and googly eyes on everything. (Happy sigh.) Yup. That's my happy place. Today I'm joining with 34 other kid bloggers to share some fun, process oriented art activities that children will enjoy! It's a series all about fun and messy exploration. So check the bottom of the post for a link to all 35 ideas! During a nature walk, we counted quite a few red trees outside. Boy, was I surprised! 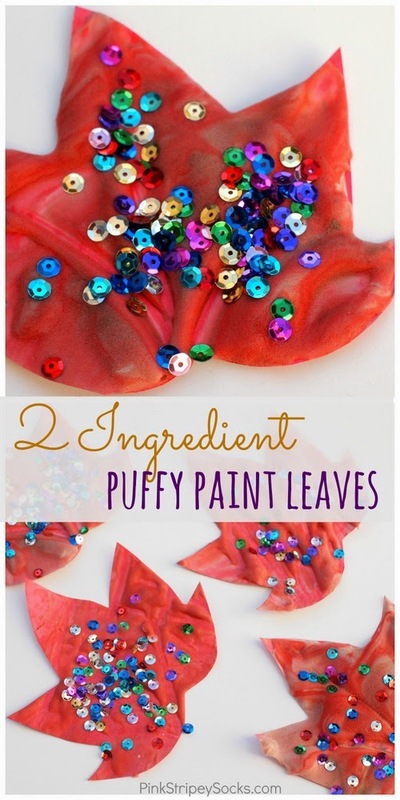 So we drew inspiration from them and made these two-ingredient Homemade Puffy Paint Fall Leaves! Awhile back we had some success making gluten free homemade puffy paint. But I was feeling kind of lazy and didn't have all the right materials on hand. 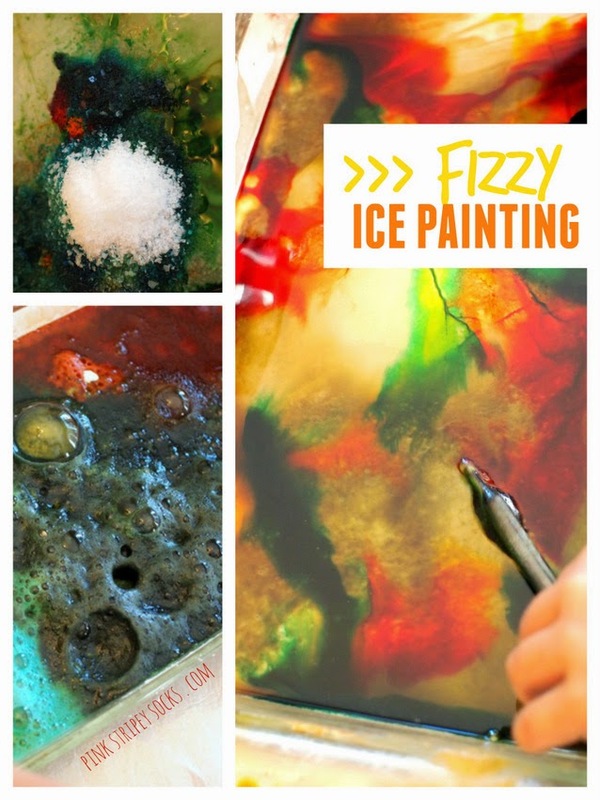 Luckily, we found a super easy recipe for puffy paint on several blogs, and tried it out. I'll bet you could easily make this puffy paint today. You probably have all the ingredients already at home. Note this post contains affiliate links. Thank you so much for your support! About a month ago, I received a free copy of 101 Kids Activities to review. 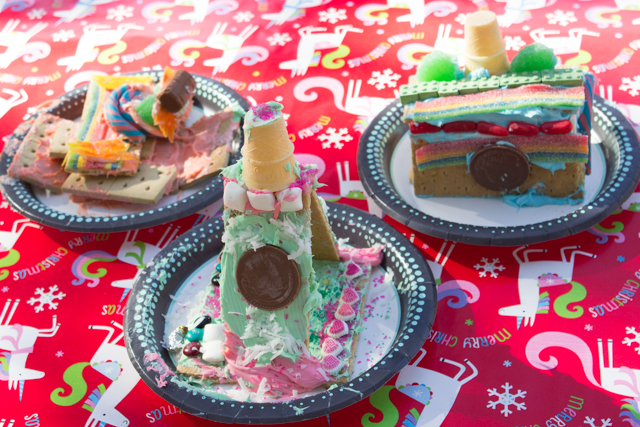 It was written by the amazing kid blogger duo Rachel and Holly from Kids Activities Blog. These ladies are like the queens of kid fun and I was super excited to see what they had in store. 101 and activities? Wowzers. After looking through the book, I can definitely say that it is an awesome go-to resource for anyone who wants to battle kid boredom. (Which seems to be especially prevalent in the summer... right?) The activities are super fun and use everyday, affordable materials. Here's an example of one activity that Chuck and I tried out from the book- bubble prints! Last week I shared a simple 3-ingredient homemade body paint recipe. While we had fun trying it out, I kept wondering if there was another way to make homemade body paint. Turns out there is! I peeked around the internet and found this neat series of body paint recipes. The author shares a couple recipes that involved using washable white paint (which I kind of felt weird using on my skin...) and one that involved using two ingredients that I already had on hand. A couple of days ago my sister came over to visit. Chuck and I were super excited for her to come. She also enjoys making things so I wanted to try Paging Fun Mom's homemade body paint with her. I ended up not following their recipe and just winging it. It still came out and we had lots of fun painting homemade body paint on ourselves. You just need three ingredients to make this creamy (and very moisturizing) body paint. Just FYI- it has a completely different consistency then real body paint and it's not meant to stay on. But that was ok with us. We ended up painting our pictures, wiping off our artwork, and then painting something else. Interested? Let's get making! Today's craft is going to be a super easy 3 ingredient slime recipe. I originally found this slime recipe on fellow Rockin Arts Mom Blog Me Mom 's site. (She's amazing and her site has tons of other great slime recipes and crafts...so definitely check it out!) I had to post this recipe here because it's AMAZING! Erm... just how amazing? Well, this past week I made 12 batches of slime. 12 batches! I know, crazy right? But that's just a testament to how cool this homemade slime recipe is, and how super duper easy it is to make. Yup. This stuff kept kids aged 2 - 30 something (erm... ok... me) entertained. And here are the 4 reasons why it's super AWESOME. 1. It's Borax free. No scary chemicals lurking here. 3. You only need 3 ingredients to make it. 4. You can make it in the microwave. Excited? Now let's get started! When you were a kid, did you enjoy seeing how oil and water would not mix? I always thought that was so neat. (I'll even admit, sometimes even now as an adult, I shake salad dressing bottles at the store just to watch that happen. Is that weird?) Eh hem... anyway... a couple of days ago, Chuck and I played around with this phenomenon. We placed some colored ice cubes into cooking oil and watched them melt. The results were just really, really beautiful. Can science be dreamy? I hope so, because that's the best word that I can think of to describe what I saw. Now Chuck didn't appreciate how the colorful bubbles looked like jewels, but he did enjoy swishing and moving the liquids around. Keep reading to see how we played with oil and water!